Midsize pickups are becoming increasingly popular, so let's put one of them to the ultimate test by pitting the Toyota Tacoma head-to-head against the all-conquering 2018 Ford F-150. It's not going to come as a surprise to anyone that the full-size Ford F-150 can offer greater levels of capability than the midsize Tacoma, but just how big is the gap really? The maximum towing capacity of an F-150 is currently 12,100 pounds, and the maximum payload rating is a very healthy 3,270 pounds. To be honest, the difference is stark. The maximum a Toyota Tacoma can tow is a modest 6,800 pounds, and the biggest payload it's rated to handle is just 1,620 pounds. It could be said that this isn't a fair fight as we're talking about two different classes of truck, but we'll get to that a little later. The idea that trucks are bought solely for what they can do rather than how they look no longer holds water. While capability is very important, more and more of us are buying trucks we don't actually need because we love their look. This is why midsize trucks like the Tacoma are beginning to find their feet again; and the Toyota is a good-looking truck. It's also quite a tough, rugged-looking pickup and not as pretty as some in the midsize realm, so Toyota has struck a pretty good balance with this one. You know an F-150 when you see one, and the vast majority of us love what we see when we come across one, which is pretty much every day. 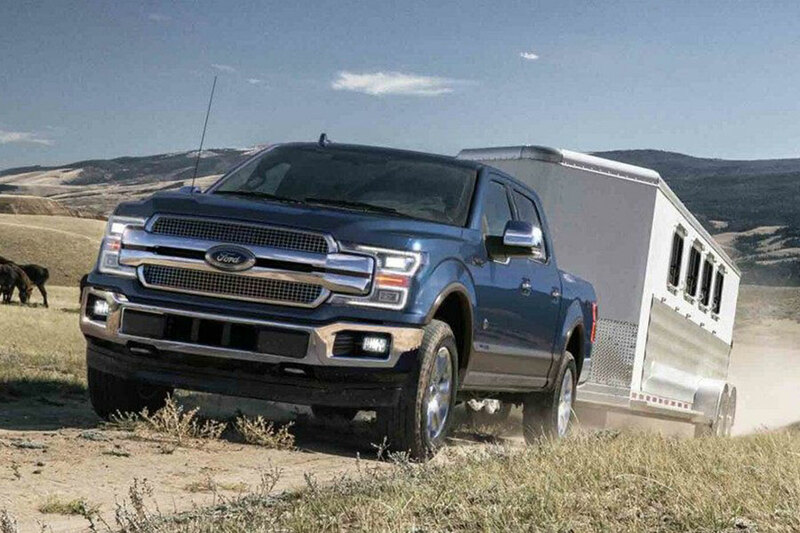 The 2018 model has taken a large dose of Super Duty styling, which only further adds to the Ford's massive appeal and gives the F-150 another win for styling. Imagine it and you can probably have it with a Ford F-150. The Ford can be anything you want, from a utilitarian workhorse to a plush office on wheels with levels of comfort and opulence to rival a lot of luxury sedans. There are seven different trim levels, three cabs, three bed sizes, and all the options you could ever want. Six different trims are available for the Toyota Tacoma, along with two cabs and a trio of beds. That's pretty good for a midsize, but it's no match for the Ford, and that's before getting to engine options where the Toyota gets out-gunned again. This is where the midsize Tacoma comes into its own here, right? Well, yes and no. At the entry level, the Tacoma costs almost $2,500 less than its F-150 equivalent, and the most expensive Tacoma starts below $44,000, compared to an eye-watering $64,275 for an F-150 Limited. It's a win for the Toyota here. Yes, you can buy a midsize Toyota Tacoma for less than it costs to buy a 2018 Ford F-150. However, unless you really need the more compact proportions of the Tacoma, the F-150 is an awful lot more truck for not a lot more money. The Toyota may be cheaper, but the Ford is infinitely better and more capable and we think represents considerably better value for money.